2-Susan Butler was born in 1813 in Athy, Ireland and died on 27 Mar 1872 in Hobart, Tasmania at age 59. Susan married Samuel Lapham in 1829 in Ireland. Samuel was born in 1805 in Skerries, Kildare, Ireland and died on 5 Jun 1876 in Buckland, Tasmania at age 71. Sameul Lapham's life is quite well documented after his arrival in Van Diemen's Land, he was appointed Superintendent of convicts at Darlington, Maria Island where he was subsequently dismissed for leniency towards a fellow country man William Smith O'Brien. The establishment has been under the direction of Mr. Lapham, superintendent, from the formation of the station in August, 1842. Mr. Lapham is a person of a benevolent disposition, singularly mild and unassuming, and has displayed much activity, diligence, and energy in the many years of his direction of the station. The Superintendent, Samuel Lapham, was one of the most higly regarded penal officers in Van Diemen’s Land and appears to have been a humane man as well as a good administrator. He, and his senior assistant James Boyd, made Darlington undoubtedly the best run station in the colony. Lapham was transferred to Port Arthur in charge of William Smith O’Brien, the Irish political prisoner, in October 1850, but within a month he was dismissed from the convict service by Hampton on the grounds that: 'In confiding to your charge a prisoner of the description a trust was unhappily reposed in you for the faithful and proper charge of which you were altogether incompetent'. It was believed by both O'Brien and Lapham that htis dismissal was the result of Lapham's kindly treatment of O'Brien. Lapham fought he dismissal, but his appeal was unsuccessful. 3-Frances Eleanor Lapham was born on 13 Nov 1830 in County Kildare, Ireland and died on 24 Jul 1888 in Sandy Bay at age 57. Frances married Reverend Charles Dobson, son of John Dobson and Elizabeth Barker, on 2 Mar 1846 in St George's Church, Hobart, Tasmania. Charles was born on 11 Jan 1815 in St. Pancras, London, England and died on 17 Jun 1888 in Sandy Bay at age 73. They had five children: Alfred, John Howard, Charles Maclean, Lucy Flora and Edward Samuel. 4-John Howard Dobson was born on 16 Apr 1852 in Tasmania and died on 23 Jun 1925 in Neslon, New Zealand at age 73. 4-Lucy Flora Dobson was born on 17 Nov 1854 in Bucland, Tasmania and died on 5 May 1934 in Latrobe, Tasmania at age 79. Lucy married Henry Cruttenden Mace, son of Henry Mace and Casroline Cruttenden, at Buckland on 29 Feb 1876, aged 21. Henry was born on 22 Dec 1836 in Sydney, New South Wales and died on 12 Dec 1882 in Sandy Bay, Hobart, Tasmania at age 45. He was the son of Henry Mace (1795-1856) and Caroline Cruttenden (1805-1852). Caroline was born in Kent, England and was a younger sister of Thomas Cruttenden who was one of the earliest settlers in the district known as Prosser's Plains, where, prior to 1840, a survey for the proposed township of Buckland had been carried out. As a landed proprietor in the district, Thomas Cruttenden was one of the major benefactors that enabled the establishment of the St John the Baptist Church. 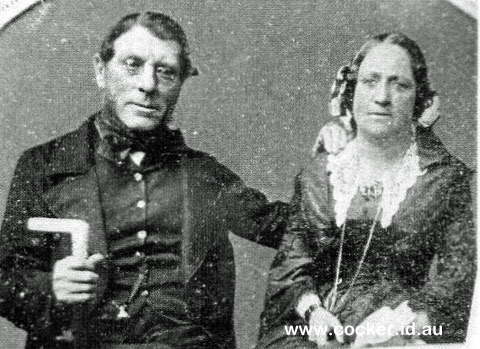 His sister, Sarah Cruttenden married the Reverend F. H. Cox, the first rector of the Prosser's Plains district and was succeeded by Lucy's father Reverend Charles Dobson. After the deaths of the parents of Henry Mace Jnr. in Sydney the Mace children came to Buckland and into the care of their Cruttenden relatives. In this way Henry Cruttenden Mace Inn would have met Lucy Dobson at Buckland. Lucy and Henry lived at Stonehurst, a 2,881 acre property at Buckland where they raised three children: Caroline Cruttenden, Ann Catherine, and Lucy Elizabeth. Henry's marriage in 1876 to Lucy was brief, as a little over six years later, he died at Sandy Bay. It was on his 47th birthday on 22 December, 1882. Lucy was then a widow at the age of 28 with three young daughters. For about five years from 1901, Lucy rented a house in Launceston, initially at 2 Patterson Street then at Wellington Street. At the age of 51, Lucy married again in 1906 to Alexander Gibson Smith [1843-19211 who had a farm Egmont, near Wilmot. They lived at Wilmot for 15 years until her husband died in 1921. Lucy then went to live with her daughter Caroline Packett at Barrington where she died in 1934. Lucy and Henry had three daughters: Caroline Cruttenden, Anne Catherine and Lucy Elizabeth. 5-Caroline Cruttenden Mace was born on 26 Nov 1876 in Spring Bay and died on 28 Oct 1958 in Devonport, Tasmania at age 81. Caroline married Charles Packett, son of Charles Packett, on 16 Apr 1903 in All Saints Church, Hobart, Tasmania. Charles was born on 28 Oct 1870 in Barrington, Tasmania and died on 31 Jan 1967 in Devonport, Tasmania at age 96. He served in the Boer War. They had four children: Donovan Henry Charles, Douglas Alexander Cruttenden, Janet Lucy and Brian Arthur Cruttenden. 6-Donovan Henry Charles Packett was born on 18 Feb 1904 in Barrington, Tasmania. Donovan married Saidie Tasma Morey, daughter of Archie Manton Hedley Morey and Ada Mary Cocker. Saidie was born on 12 Nov 1904 in Barrington, Tasmania. 6-Reverend Douglas Alexander Cruttenden Packett was born on 24 Aug 1905 in Barrington, Tasmania and died in 1991 at age 86. 6-Janet Lucy Packett was born on 7 Nov 1908 in Barrington, Tasmania and died in 1985 at age 77. Janet married H. V. White. 6-Brian Arthur Cruttenden Packett was born on 4 Sep 1910 in Barrington, Tasmania and died in 1975 at age 65. 5-Anne Catherine Mace was born on 3 May 1878 at Spring Bay, Tasmania. Lucy next married Alexander Gibson Smith, son of Alexander and Christiana Smith on 26 Apr 1906 at St. John's Church of England, New Town. He was born in Launceston on 23 May 1843 and died at Wilmot on 15 May 1921. 3-Ann Lapham was born on 10 Apr 1835 in Tasmania and died on 14 Nov 1887 in Melbourne, Victoria at age 52. Ann married Malcolm Harcus Smith. Malcolm was born in 1825 in England. 3-Susan Lapham was born in 1837 in Tasmania and was christened in Sorell, Tasmania. Susan married John Nugent Wood. 3-Joseph John Lapham was born in 1839 and died in 1852 in Hobart, Tasmania at age 13. 3-Charles Henry Lapham was born in 1847 in Spring Bay.